I own a critically endangered plant. It comes from Madagascar, an island degraded by human activity and peppered with endangered species. When I discovered the news that my Gerold’s Thornless Crown of Thorns was on the brink of extinction, I had a flashback to planning the Rare & Endangered Plants Garden for the Royal Botanic Gardens, Sydney back in the 1990’s. “Isolated from the rest of the world, island plants and animals tend to evolve in ways that make them different from their mainland relatives. Because of limited area, an island holds a relatively small population of any animal or plant, and a small population is more easily wiped out. The arrival of Polynesians in Hawaii 1,500 years ago is thought to have consigned as many as 40 bird species to oblivion, and with them the plants that depended on those birds for pollination. Since settlers reached Madagascar 1,500 years ago, about 80% of the original forest has disappeared. Tiny Philip Island, south of Norfolk Island, was denuded by rabbits, goats and pigs introduced by European settlers. However, since rabbits were eliminated in 1986, plant species previously thought extinct have re-emerged from dormant seed. Mining on the Pacific Island of New Caledonia has devastated habitats that are home to many of New Caledonia’s rare native plants. The island’s soils are fragile and revegetation takes decades after they’ve been disturbed”. Last winter, I bought my specimen of the Thornless Crown of Thorns (Euphorbia geroldii) because I had only ever seen one in a book. This pretty little succulent is never without flowers, and one feature is these usually open in pairs. It’s cute. This plant forms a small bush about 60cm high, so it’s good for a pot or well drained border. The glossy leaves, which thicken up in summer, turn this into such a lush little plant you might overlook the fact that it is a succulent. 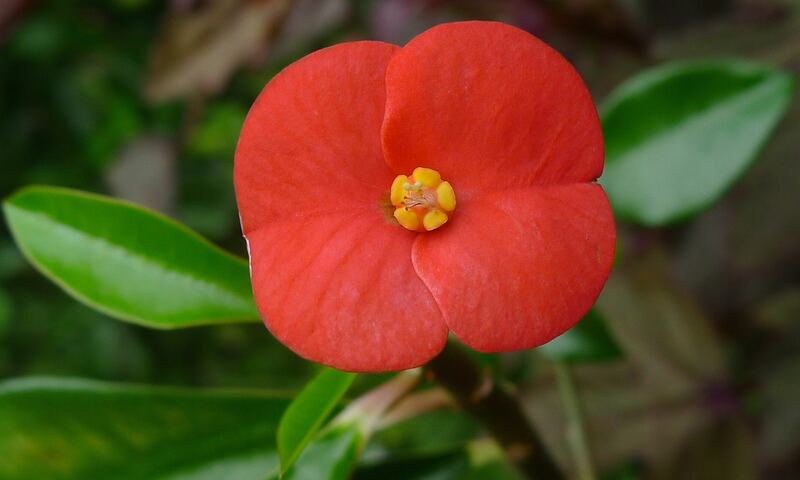 While the Thornless Crown of Thorns is thornless, it is a Euphorbia. So you must protect your eyes and skin from its caustic, toxic sap. I checked out some information on the web and found that, while it is sold commercially, it is at risk of extinction in the wild. So many plant species are now threatened with extinction while the news was unexpected, this situation is commoner than you’d think. Around 15-20% are now threatened. Many years ago, I wrote an article ‘Rarity is commoner than you think’ for the Friends of the Royal Botanic Gardens, Sydney. The piece served to illustrate both the sharply rising number of endangered species on Earth (and in botanic garden collections). Many species, while rare in nature, are not necessarily difficult for ordinary gardeners to grow or propagate at home. The International Union for the Conservation of Nature (IUCN) publishes a Red List of threatened species which classes the Thornless Crown of Thorns, Euphorbia geroldii, as critically endangered. It is endemic to north eastern Madagascar, where it grows in coastal forest on sand. It is found only within forest surrounding the small city of Vohemar (aka Iharanae), in an area (from GIS analysis) below 1 km². The IUCN say this species is highly susceptible to any disaster, including human induced fires, habitat degradation and habitat clearing for making charcoal. Collection of wild plants for local and international horticultural trade is also a threat, so trade in this plant is regulated by the Convention on International Trade in Endangered Species of Wild Fauna and Flora (CITES), an international agreement between governments. CITES aims to ensure that international trade in specimens of wild plants (and animals) does not threaten their survival. Euphorbia geroldii is listed under Appendix II. Many succulent species of Euphorbia can be propagated by stem cuttings, so yesterday I created forty cuttings by pruning my plant into a more even, rounded shape. I left the cuttings in a seed tray for a couple of hours so that the wounds would stop dripping sap, making them safer to handle. They are now inserted into a seed tray filled with a half and half mix of fresh, premium grade potting mix and washed, horticultural sand. The leaves on the parent plant were recently burned during the heatwave, a reminder that this is a woodland plant which can’t cope with all day summer sunshine in Brisbane. Lesson learned, I put the tray of cuttings where they will get three to four hours of morning sunshine during the rooting period**. The potting mix was slightly damp, so I won’t water them for a week or so. As with all succulents, the soil or mix in which they grow should be allowed to dry out in between each watering. I’m growing the parent plant in a terracotta pot using equal parts of premium potting mix and washed horticultural sand as the growing medium, and I have mulched the surface with a 1cm layer of gravel. Nurseries in the USA say this plant can be trained into cute, ever-flowering miniature standards* half a metre tall. I’ll give it a try. In the USA, hummingbirds, butterflies and lizards drink their nectar. Red and orange coloured flowers attract birds, and Euphorbias produce copious nectar. It’s rare for a flowering plant to exist without a pollinator(s), but no one seems to have found Euphorbia geroldii bearing seed in the wild. Possibly it has a relationship with a wild pollinator specific to the same forest and, so far, no other animal has yet shown that it can replace the original pollinator. Such interdependence between wild plants and animals is widespread. In my garden, I use various species of Euphorbia to attract parasitoid wasps, which help control caterpillars in my food garden. I have observed that in my garden the stingless bees I keep – Tetragonula carbonaria and T. hockingsii – have successfully pollinated its flowers. I now have three seedlings germinating in my garden. A couple of gardeners have confirmed their plants have self-sown in their gardens too. Whether these are the species or they have hybridised with other Euphorbia species is another question to answer in time. Comment: Many thanks for your expert and entertaining contributions to ABC’s Gardening Australia. I particularly share your enthusiasm for Euphorbia geroldii. Six well-established specimens, now up to 1 m high, bloom prolifically in a garden bed flanking my north-facing bedroom. Although they receive somewhat more than the recommended 4 hours’ daily sunlight, the main factor in their success is regular watering and mulching. Surprisingly, the species seems not to be stocked by local nurseries. My cuttings came from a relatively large, bushy plant growing in the garden of a Toowong apartment complex, where my American friends stay on their 3-4 months’ annual visit (thus escaping the Michigan winter). Other prize exotics in my home garden are two Brazilian natives (Calliandra brevipes – surely the best of the Calliandra!) and Turnera subulata, redolent of years spent working in that great country. Geoffrey P., Prof Emer., School of Earth and Environmental Sciences, The University of Queensland. Hi Gerry, I have a climber that I cannot find info about can you help please. It is Arribidaea cinnamomea. I have tried quite a few resources without luck, HELP! Hey Jerry curious as to how the wasps have taken to E. geroldii in your garden. Im curious to use it as I noticed a specimen next to E. millii at Mt Cootha on the westish side of the dome and black flying insects were swarming the E. geroldii but none were on the E. millii. I really like the idea of having standards grown in terracotta pots in the garden to attract wasps. I can’t comment on wasp use of the flowers, however I have observed stingless bees harvesting their nectar here.